The monument is 19 feet 3 inches (5.87 m) tall, made from six granite slabs weighing 237,746 pounds (107,840 kg) in all. One slab stands in the center, with four arranged around it. A capstone lies on top of the five slabs, which are astronomically aligned. An additional stone tablet, which is set in the ground a short distance to the west of the structure, provides some notes on the history and purpose of the guidestones. Who would have sponsored such a thing? No one knows! The story of how one R.C. Christian appeared out of nowhere, commissioned the monument from Elberton Granite Finishing, paid for it, and then disappeared, never to be seen again, is detailed in an interesting Wired article from ten years ago now. People surmise that “R.C. Christian” is a reference to “Christian Rosenkreuz,” the alleged founder of Rosicrucianism, and that the deliberately lowballed total human population number is intended as advice for the survivors of a nuclear war (this was a concern in 1980). Of course, the prescribed One-Worldism, the appeal to Enlightenment-style “reason,” and the seeming endorsement of eugenic practices are objectionable to a lot of people, especially around these parts. That Yoko Ono found it inspiring probably doesn’t help on this front. 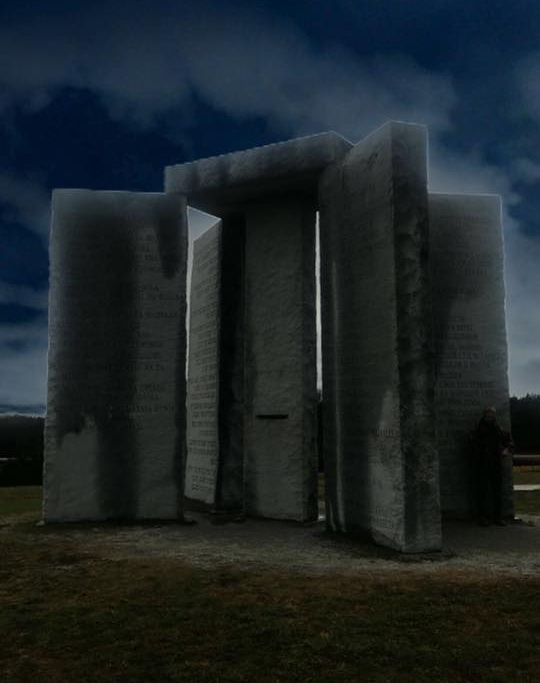 Some people have called the Guidestones a “sinister site,” the “Ten Commandments of the Antichrist,” and “of deep Satanic origin,” and vandals have occasionally attacked them. But Elbert County, which owns the monument, has no plans to tear it down. In fact, locals appreciate the fact that they have such an enigmatic tourist attraction – one that, if nothing else, showcases the county’s granite, its most well known product. This entry was posted in Georgia, Monuments, Mysteries by jgood. Bookmark the permalink. I think that the monument has Ba’hai overtones. Particularly the points about the universal language and world court. But creating something oddball like this isn’t particularly Ba’hai style. They love to get publicity for their doings. Like the Ba’hai Peace Park on Cavan St. in Port Hope. As though they have some kind of monopoly on the desire for peace. (Unlike all them other religions.) One of their interesting beliefs is the oneness of science and religion. I don’t think that this makes sense. It’s like trying to mix oil and water.